Kingsford-Adaboh while Prof Simon Connell watches. Dr. Olusola O. Elekofehinti of the Bioinformatics and Molecular Biology Unit of the Federal University of technology Akure has been presented the Best researcher among about 400 researchers that attended the just Concluded Joint 2nd Conference of the AFRICAN LIGHT SOURCE (AfLS2) and PAN AFRICAN CONFERENCE ON CRYSTALLOGRAPHY (PCCr2) held at the Bank of Ghana Conference Hall, University of Ghana, Accra Ghana. His research work on the design of a potent compound as an inhibitor of enolase protein found in Samonella typhi which could be the next line of antibacterial drug against salmonella typhi, the bacterial that causes typhoid fever was given the best research award during the conference. 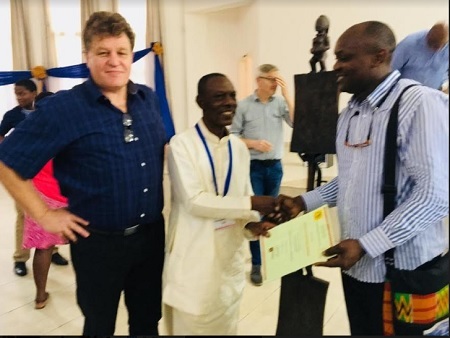 The theme of the conference that spanned between 28th January to 2nd February was Crystallography, a tool for sustainable development in Africa. The conference had in attendance researchers of repute from across the globe such as United kingdom, Sweden, France, Italy, United State of America, Germany, Japan, South Africa, Algeria, Benin Republic, Cameroon, Bostwana e.t.c. Prof. Tom Blundell, a professor of Biochemistry from University of Cambridge who was part of Dorothy Hodgkin team that solved the first structure of protein hormone insulin in 1969 was in attendance. This is a big one coming from Nigeria and Dr. Elekofehinti has really made Federal University of technology Akure, Nigeria and Africa at large proud with this milestone. Great FUTARIAN....Proud to be an alumni of this great institute. Great work and achievement my able Dr.
Congratulations. However, please Nigerian media houses need to maintain integrity in reporting. Kindly correct the news, research poster is different from Best Researcher. Poster award is about how well understood your research presentation is, alongside the study. It is not about ground breaking of the study itself.